We are planning to walk from Nikkaluokta to Abisko with the possibility of a detour to see the glacier at Tarfala. Now along this trail there is the possibility of using electricity in some of the cabins but do I really want to add the battery charger to my already heavy bag? When I say heavy it’s looking like 10 – 11kg so far (minus food). I wouldn’t call that heavy compared to some bags i’ve see along this route but personally I like to be as light as I can. So the DJI Spark weighs 300g and each battery weighs 95g separately. With the Spark, controller and 3 x batteries I’m looking at around 750g. 20,000 mAh powerbank It is important to make sure you have a power bank that is fast charge 3.0 or you will wait ages for it to charge. After a test with my 20,000 man powerbank it was obvious it was taken ages (almost over night to charge one battery). So after draining a battery down and plugging the drone directly to the new powerbank it took 1:20 mins to fully charge the battery using 1/4 of the powerbank. Therefore I could theoretical charge 4 x batteries of the this powerbank. A previous post shows why I chose the DJI Spark for my hiking trips the only disadvantage this little drone has is the battery life (each battery lasts around 16 minutes). So with 3 batteries and a recharge from this powerbank that gives my roughly 1:45 total of flying time. As we will be walking through 24hrs daylight I though I would take my solar panel so I could trickle charge the battery whilst walking during the day and allow the battery to recharge whilst sleeping. The solar panel I use is by a company called Portapow (I don’t think they are about anymore). This solar panel is 7W and the great thing about it is I can directly charge my iPhone or my camera. Can the panel charge the spark direct? The panel doesn’t have enough power to charge the Spark directly but to get around this I can plug the battery into the panel and charge the Spark whilst the battery is charging of the panel. Then the other problem is as I would normally use my powerbank to recharge cameras and my phone what do I use to charge them now? I will be using pretty much all of my power on the Sparks Batteries? It looks like another powerbank will be used for these. (more weight!). 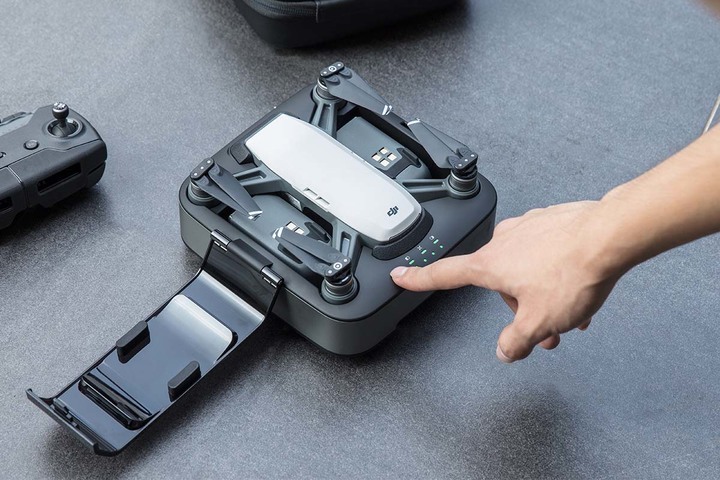 The other option is the DJI Portable Charging station but you have to think of the weight and of course the size of this device. I have seen great feedback about it but I don’t think it’s for me. Here is my other article on power outdoors. How do you Charge your DJI Spark whilst outdoors. Previous PostPrevious DJI Spark perfect drone for outdoor enthusiasts.